Punjab, state of India, located in the northwestern part of the subcontinent. It is bounded by the Indian states of Jammu and Kashmir to the north, Himachal Pradesh to the northeast, Haryana to the south and southeast, and Rajasthan to the southwest and by the country of Pakistan to the west. Punjab in its present form came into existence on November 1, 1966, when most of its predominantly Hindi-speaking areas were separated to form the new state of Haryana. The city of Chandigarh, within the Chandigarh union territory, is the joint capital of Punjab and Haryana. The word Punjab is a compound of two Persian words, panj (“five“) and ab (“water“), thus signifying the land of five waters, or rivers (the Beas, Chenab, Jhelum, Ravi, and Sutlej). As applied to the present Indian state of Punjab, however, it is a misnomer: since the partition of India in 1947, only two of these rivers, the Sutlej and the Beas, lie within Punjab’s territory, while the Ravi flows only along part of its western border. Area 19,445 square miles (50,362 square km). Pop. (2011) 27,704,236. Punjab is widely acknowledged as the "Granary of India". Since the land is fertile and its mainly free from physical undulation, agriculture is the mainstay of the State. Major crops include wheat, rice, sugarcane, cotton and oilseeds. Punjab is the second largest producer of wheat in India. Industrial growth in recent years has been a major contributor to the state's economy. The excellent infrastructural framework namely connectivity by road, rail and air has paved way for industrial prosperity. The prime industries are textile, food processing, sports goods, engineering goods, chemicals, handicrafts. 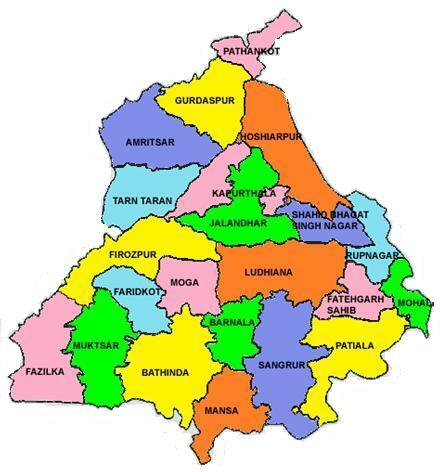 22 (Amritsar, Sahibzada Ajit Singh Nagar, Barnala, Bathinda, Faridkot, Fatehgarh Sahib, Fazilka, Ferozepur, Gurdaspur, Hosiarpur, Jalandhar, Kapurthala, Ludhiana, Mansa, Moga, Sri Muktsar Sahib, Pathankot, Patiala, Roopnagar, Shaheed Bhagat Singh Nagar, Sangrur, Tarn Taran. Agro and food processing, Beverages, IT and knowledge, Textiles, Hoisery, Wollen garments Tourism, Handicrafts, Automobile, Chemicals, Metal and Light Engineering.